For a few years now, I have been working on a project I have titled The Stone Faces project. The focus is the beauty that can be found in the grave statuary people create to celebrate and perpetuate the memories of those who haves passed. Today’s gallery is not a complete showing of the portfolio for that project, but a spot light of one particular contributor to that project. 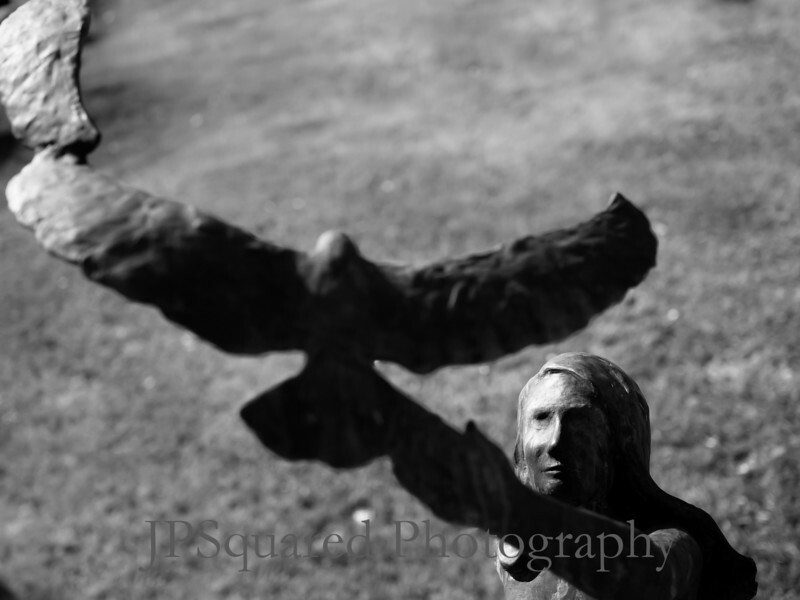 Last week I drove down to Louisville to shoot at Cave Hill Cemetery. Cave Hill is the grand cemetery in Louisville, similar to Crown Hill in Indianapolis, Homewood in Pittsburgh or Spring Grove in Cincinnati. During winter months I often shoot in cemeteries, working on the project. The gloom of a cloudy, snowless winter doesn’t distract from the subject matter. I often find similarities in many cemeteries, the statuary of the day was often mass produced nationally even though a only single version of a sculpture may find its way into a particular cemetery. Once there, it is usually mounted in a unique way. Cemeteries in large cities often present some unique finds as the wealthier citizens of a town commission custom, unique works. While the time frame is not specific to a certain era, overall it seems the twenties were a high water mark for these commisions. But Cave Hill takes that a step further. Yes they have stones from those days gone by but in Cave Hill you find many contemporary bronze sculptures throughout the more recent, eastern part of the cemetery. Seems there must have been a local artist who worked in bronze who was all the rage in recent years. Many of these are frankly, a little odd, but then the choices people make aren’t often understood outside the context of the love and memories felt for a cherished family member or the sense of self expression a person wanted to offer of themselves. Many of these are stunning. Many, including those depicting children are extremely sad. I have visited Cave Hill twice. Both days it was cloudy when I left home and brightly sunny when I made it south, the harsh sun often making it very difficult to get good images of many of the statues. I expect I will make more visits in the future years to complete the collection more fully to my satisfaction. In the gallery below I have included a few of the images (from both visits, 2016 and 2018) I am pleased with along with that of the grave of Cave Hills most famous resident.